generally useful that her brothers were delighted, and they all lived happily together. One day the two at home prepared a fine feast, and when they were all assembled they sat down and ate and drank and made merry. which grew twelve tall lilies. The girl, wishing to please her brothers, plucked the twelve flowers, meaning to present one to each of them as they sat at supper. 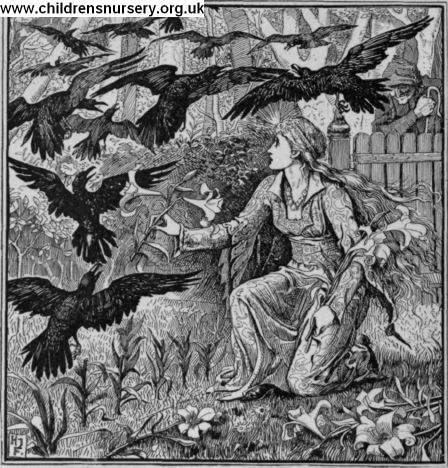 But hardly had she plucked the flowers when her brothers were turned into twelve ravens, who flew croaking over the wood, and the house and garden vanished also.